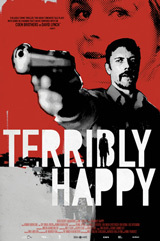 An interview with HENRIK RUBEN GENZ director of TERRIBLY HAPPY, a narrative that focuses on Robert, a Copenhagen police officer who, following a nervous breakdown, is transferred to a small provincial town to take on the mysteriously vacated Marshall position and is subsequently entangled with a married femme fatale. Robert’s big city temperament makes it impossible for him to fit in, or understand the uncivilized, bizarre behavior displayed by the townspeople. Quickly spiraling downward into an intense fable reminiscent of the Coen Brothers’ BLOOD SIMPLE and NO COUNTRY FOR OLD MEN, TERRIBLY HAPPY displays a unique, often macabre vision of the darkest depths to which people will go to achieve a sense of security and belonging. Genz’s short fiction film TEIS & NICO (1998), was a festival hit worldwide and received the Crystal Bear in Berlin and an Academy Award® nomination. His feature film debut, SOMEONE LIKE HODDER (2003) received awards in Buenos Aires, Chicago, London, and Zlin, among others. An interview with PHILIPP STOLZL the director of NORTH FACE. 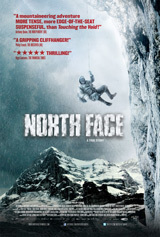 Based on a true story, North Face is a suspenseful adventure film about a competition to climb the most dangerous rock face in the Alps. Set in 1936, as Nazi propaganda urges the nation’s Alpinists to conquer the unclimbed north face of the Swiss massif — the Eiger — two reluctant German climbers begin their daring ascent. With NORTH FACE, director and scriptwriter Philipp Stölzl—a multi-talented and sought after opera, music video, commercial and feature-film director—has succeeded in redefining pre-WW II German Berg (mountain) Film and transposing it to the 21st century. 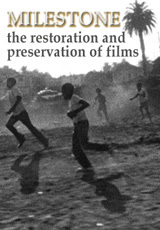 An interview with DENNIS DOROS of MILESTONE FILMS and ROSS LIPMAN film preservationist at the UCLA FILM AND TELEVISION ARCHIVE. Milestone Films is an independent company, founded in 1990 in the United States by Dennis Doros and Amy Heller, dedicated to researching and distributing quality cinematographic material from around the world, including silent movies, films of the postwar foreign film renaissance, to contemporary American independent features, documentaries and foreign films. Some of the films that Milestone has distributed are by Alfred Hitchcock, Hiroshi Teshigahara, Luchino Visconti, Pier Paolo Pasolini, F.W. Murnau, Orson Welles, Mikhail Kalatozov and Luis Bunuel. Among the modern day films are works by Takeshi Kitano, Jane Campion, Hirokazu Kore-eda, Alan Berliner and Philip Haas. Lipman has restored and preserved some landmark works of independent cinema including The Times of Harvey Milk, some of Kenneth Anger’s most prominent titles, and Milestone’s Killer of Sheep and The Exiles. He is the winner of the National Society of Film Critics Special Film Heritage Award.